Yesterday Davey and I went to the Denver Art Museum (David joined us after we’d been there a couple of hours). I can’t believe that we waited until 2 weeks before we are leaving Denver to take him. It is such a great museum. We went to see the special Nick Cave exhibit first. This was really really neat. He incorporates found objects, crochet, knitting, among other things to create his work. It’s hard to explain all of his work, but I found a nice article on him here. He makes these “soundsuits” so Davey and I watched a performance film for a few minutes. At the same time though, they were projecting these large granny square images onto the floor. I couldn’t take a picture, but that was Davey’s favorite part. He played in the square and loved seeing the image projected on him. Very fun. 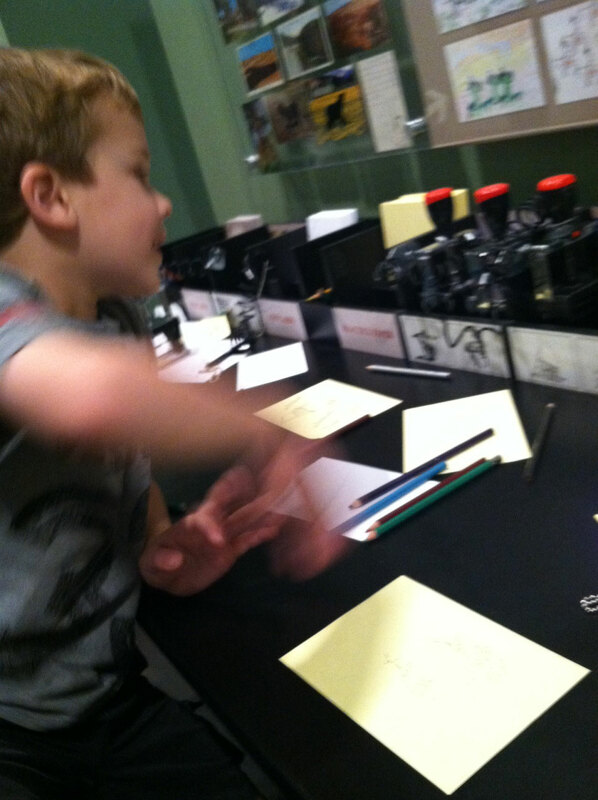 We didn’t even go through all of the museum, because there is so much fun interactive stuff for Davey to do. There are also “studios” where adults and kids can make things. We had fun stamping images of paintings and coloring them to make postcards. He actually enjoyed this for quite awhile. The nice plus was that I really did too. 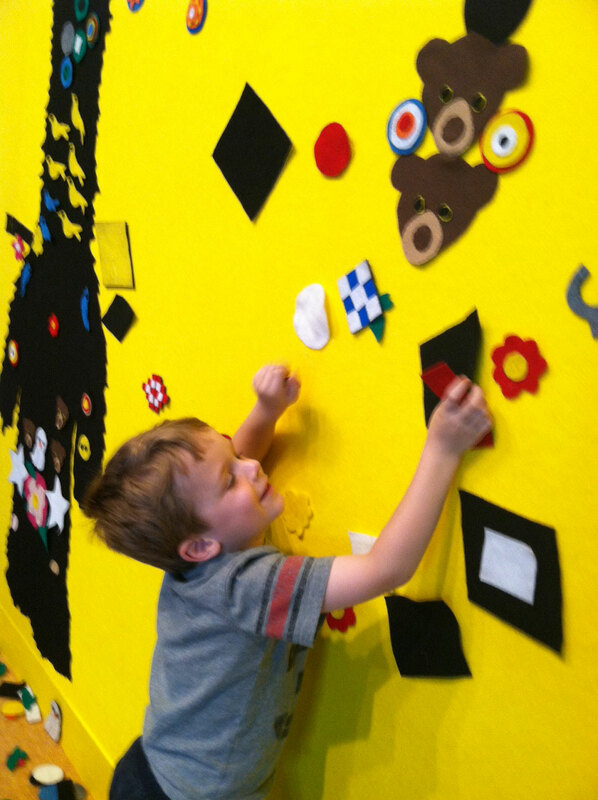 After the Nick Cave exhibit, there was this wall of felt and tons of felt stuff to arrange and play with on the wall. There was another studio near one of the exhibits of American Indian beadwork. 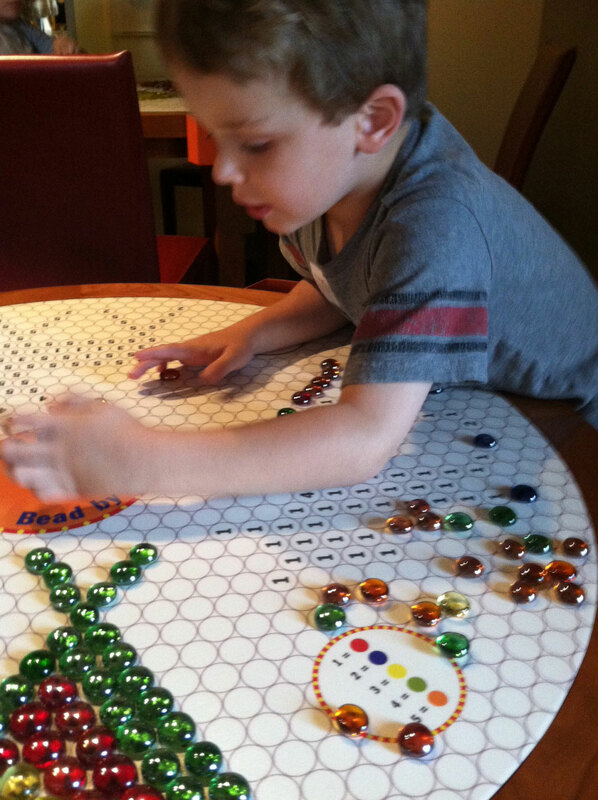 We practiced doing our own “beadwork”. We didn’t spend that much time looking at art. If you like to move through artwork quickly then Davey is the perfect companion. 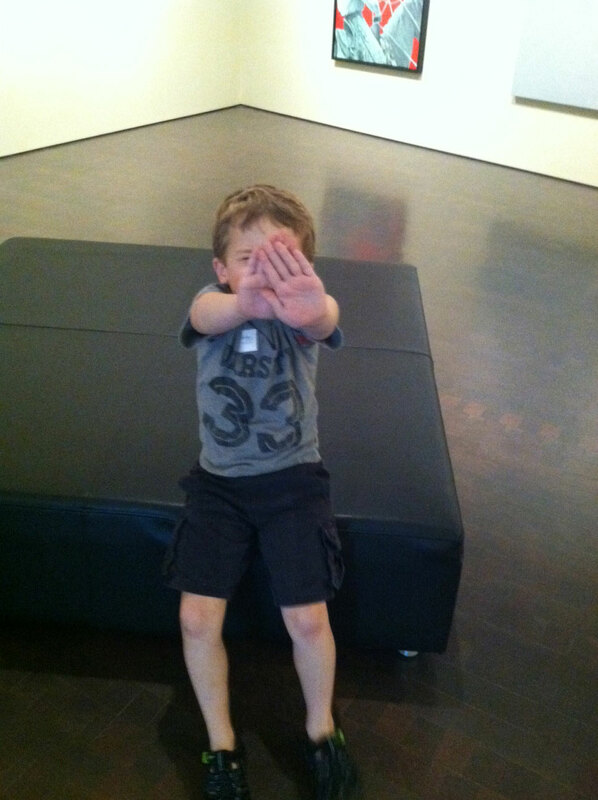 I tried to slow him down by asking him questions about what he liked or found interesting about some of the art. This worked for short periods of time. Before he sat down on this large seat he asked “Mama! Is this art?” Sometimes it can be hard to tell and he didn’t want to sit on the “art”! Davey would have preferred me not take a picture as you can see here. I can’t snap them quite as quickly and surreptitiously as I can with my good camera, so he gets annoyed with me. This is another not so good picture, but Davey rarely slows down to take a little break. 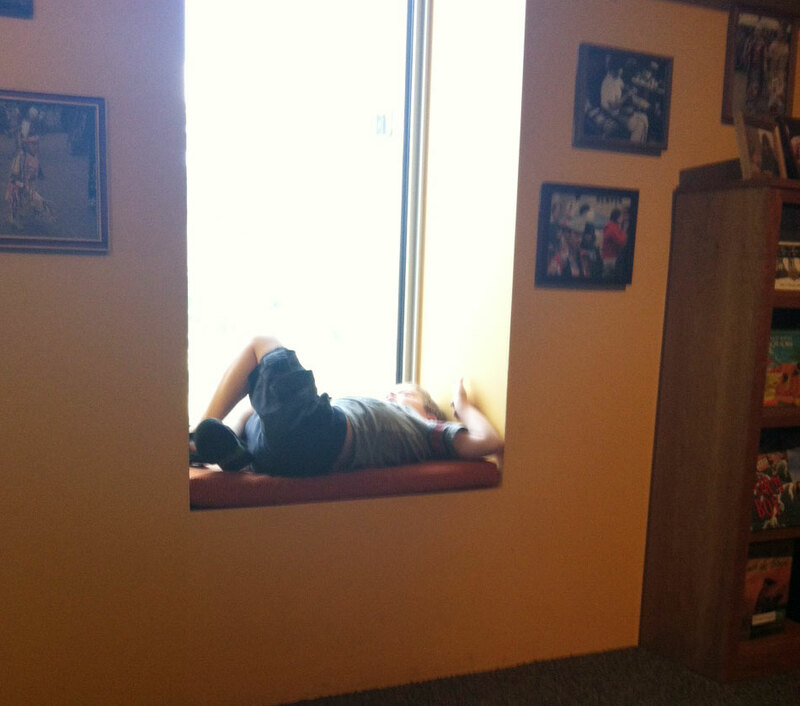 I had to get a picture of that. After his break, he had a great time playing with several other little boys at one of the play areas. 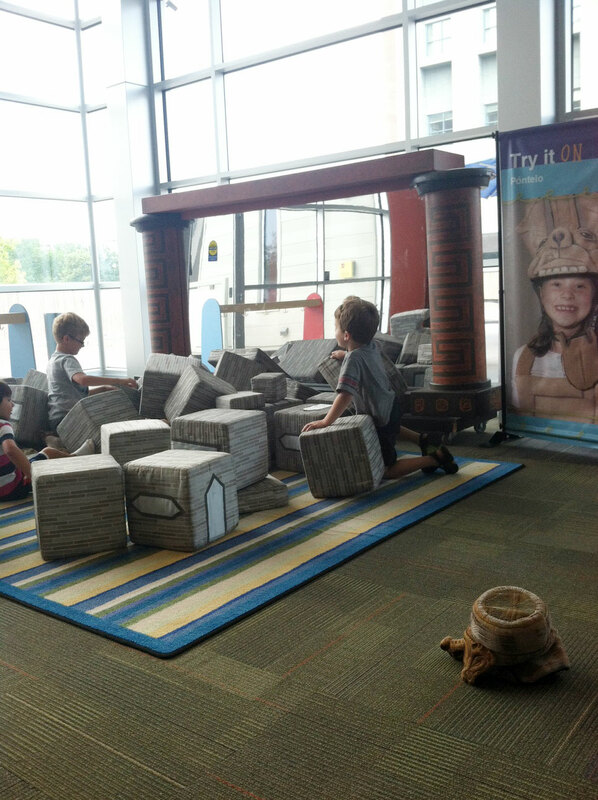 There were these giant soft cloth blocks, and they enjoyed building and tearing these down! David really enjoyed the Herbert Bayer exhibit and we all liked the Rothko exhibit as well (it’s really interesting because it shows his early work and the evolution to his later work). I’d like to go once more since we didn’t make it through all of the museum. Not sure it will happen. If not, then I will make sure we go to the Seattle Art Museum! 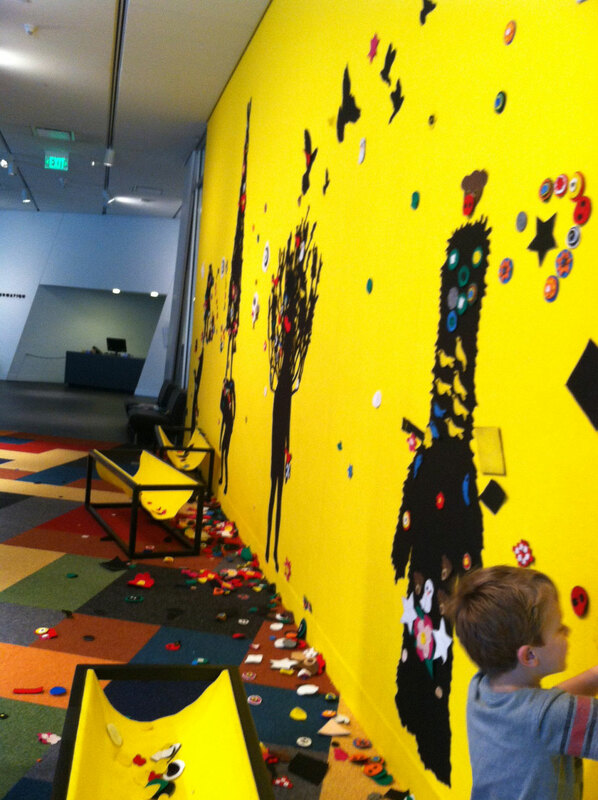 This entry was posted in Explorations and tagged Denver Art museum, Nick cave by cpeezers. Bookmark the permalink. Looks like a great interactive museum. They really had the kids in mind and now they’ll have patrons for life.